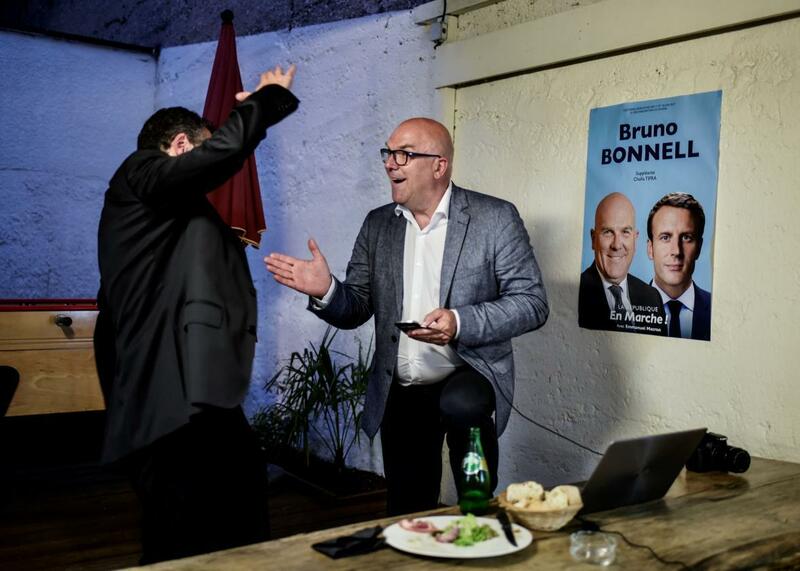 En Marche candidate Bruno Bonnell (right) celebrates with his campaign director after polls closed for Round 1 of French legislative elections Sunday in Villeurbanne, France. When he was elected president of France last month, Emmanuel Macron was hailed as a maverick, the first third-party candidate to win the Elysée since France’s Fifth Republic was established in 1958. In Sunday’s first-round legislative election, Macron did something even more impressive: His party’s candidates set the stage for a sweeping takeover of the French National Assembly, the country’s powerful lower house. According to projections from Sunday night, candidates from the centrist’s En Marche party took a huge advantage in Sunday’s first-round elections despite relatively low turnout. Ipsos says that after the second-round runoff elections—which are held next Sunday—En Marche should ultimately take between 390 and 430 seats in the 577-member house, which would give the party the largest National Assembly majority in the history of the Fifth Republic. For the first time in 50 years, more than half of French voters abstained. Between the low turnout and the strong performance of Macron’s party—whose candidates took about a third of the vote—only three candidates hit the threshold to be elected after the first round. (In 2007, more than 100 candidates hit that bar.) The low turnout also puts a small dent in Macron’s enormous mandate, as his presidential rival Marine Le Pen noted on Sunday. Still, Macron’s party appears likely to triumph in the runoff, putting the French president in a strong position to enact his reforms, including a battle with French labor unions that overwhelmed his predecessor, François Hollande. All that sort of underplays the extent of Macron’s success. His party is only 14 months old, so it held no seats in the National Assembly, whose members serve five-year terms. Experts weren’t even sure he could field enough candidates, let alone win a majority. Instead, his slate—half women, and with a significant number of minority candidates—is in pole position for the runoff next weekend. The French political system has not been as polarized as our own, but it’s not far off: The prior Assembly was split largely between the country’s two major parties, the Socialists and the Republicans, who together occupied more than 80 percent of the seats. Some of those delegates joined Macron’s party; many were replaced by political amateurs. The Socialist Party presidential candidate, Benoît Hamon, lost his seat in the Assembly—part of a rout that will likely see his party drop as many as 150 seats. That a fresh-faced outsider could win a presidential election without a party machine was surprising. That Macron has achieved what looks to be a landslide takeover of the country’s legislature is remarkable. Anyone who wants to see a third-party campaign in the U.S. should be taking notes.